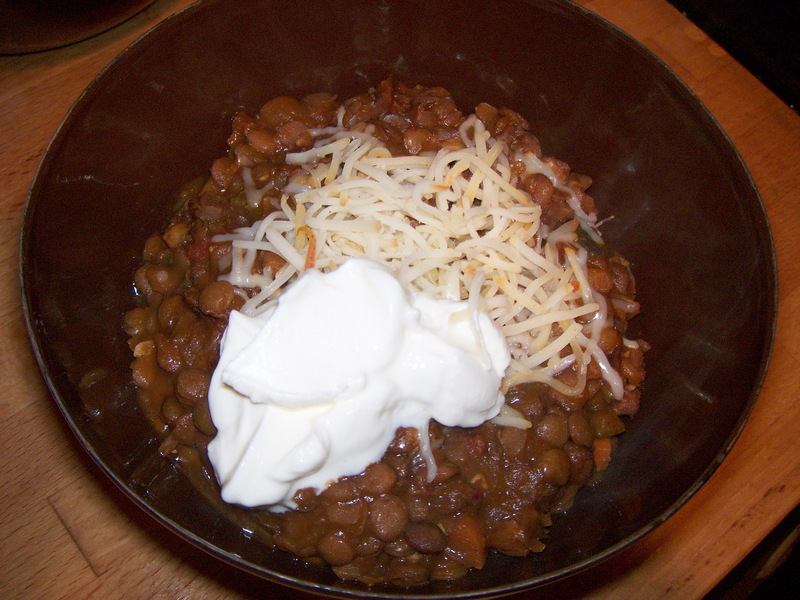 Back in college I made a lentil chili from a house mate’s cookbook that was out of this world. Seriously delicious, and I’ve been trying to track down the recipe ever since (the book disappeared from our house and I’m not sure what cookbook it was – I thought Mollie Katzen, but her lentil chili recipe is not what I remember). Anyway, a friend hosted a chili cook-off last weekend so it was the perfect opportunity to experiment with lentil chili. I decided to go with this recipe from a food blogger b/c it seemed similar to the one I remembered. It was good, not mind blowing, and we didn’t win a prize at the cookoff (not surprising though since we were the only vegetarian entry – my friend’s grandma ended up taking home the whiffle ball/bat set prize). Despite the name, and the chipotles, this chili isn’t terribly spicy and was enhanced by a shot of hot sauce on top. Heat oil in large pot or Dutch oven large enough to be your final chili pot. Add onions, carrots and celery and cook until softened, about 5-10 minutes. Add garlic, cumin, chili powder, cumin, red pepper flakes and green pepper and cook, stirring, another 5 minutes. Heat vegetable broth in separate pot until boiling. Take out about 1/4 cup of stock into a separate bowl and mix with cornstarch until completely blended into a smooth paste. Add a little more hot broth and blend in well to avoid lumps. Add this to the sauteed vegetables in chili pot. Stir and add remaining hot broth, 1 cup at a time, to blend. Add tomatoes to chili pot and bring to a boil. Add lentiles, chipotles, and beer and bring to another boil. Lower heat and simmer, 40-45 minutes, or until lentils are tender, but not mushy. Season with salt and pepper to taste.